The Non-commercial Usage Agreement is for allowing non-commercial use of web site materials. Use this agreement when allowing others to republish your materials on other sites with permission. Many individuals and companies still copy material (graphics, text, etc.) without permission. This Non-commercial Usage Agreement is included in editable Word format that can be customized in Word or by using the included Wizard software. How do you write a Non-commercial Usage Agreement document? This contract is by and between First Last hereafter "Copyright Owner" and Company Name, a company located in City, State, hereafter "Licensee". First Last (The "Copyright Owner") hereby grants Company Name ("Licensee") permission to copy, display and distribute copies of Title of Copyrighted Work (the "copyright work"),. Insert a precise description of the works to be licensed. Include all identifying details, including where and when it was previously published. If a hard copy is available insert at the end of the description "as show in the attached copy" and mark and attach the hard copy. For a period of three (3) years commencing Start Date and ending End Date, and to incorporate the copyright work, in whole or in part, into derivative works. Display rights of the Licensee shall be limited to display only on Licensee's current web sites. Licensee's right to distribute shall be limited to distribution only through Licensee's current web sites, and Licensee shall allow users of its web sites only to 1) copy or download the copyright work for personal non-commercial use, and 2) to transmit copies by email, for their personal, non-commercial use only; provided that users agree not to change or delete any copyright or proprietary notices. The Copyright Owner retains all other rights in the copyright work, including without limitation, the right to copy, distribute, publish, display or modify the copyright work, and to transfer, assign or grant license of any such rights. 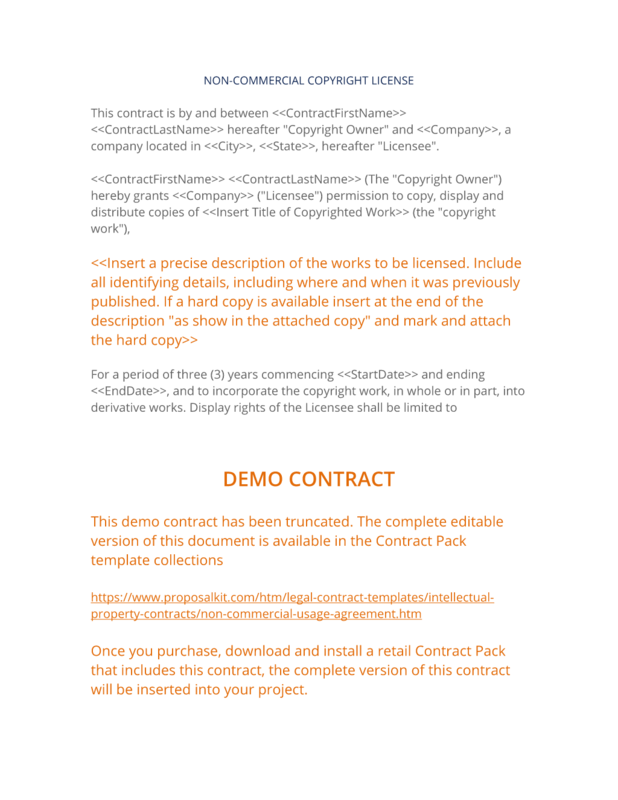 The complete Non-commercial Usage Agreement - with the actual formatting and layout - is available in this Contract Pack.